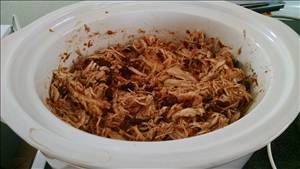 Place chicken in a 4 1/2 to 6 quart slow cooker. Pour diced tomatoes and green chilies over chicken. Rinse and drain beans, then add them to the slow cooker. Shred chicken and stir everything together. Can be served in corn tortillas with favorite taco toppings. 87 members have added this recipe to their cookbook. So quick to toss together in the morning before work. Delicious and juicy. Sometimes I leave out the beans, still very tasty. There are 141 calories in 1 serving of Fiesta Chicken Tacos. Calorie break-down: 24% fat, 29% carbs, 47% protein.